RB Properties features a collection of fine hotels in the most celebrated neighborhoods of Washington, DC. Experience the blend of historic charm at the Morrison-Clark Historic Inn and Restaurant, a stately Victorian mansion and the only downtown hotel on the National Register of Historic Places. Get a feel of true Pennsylvania Avenue elegance at Hotel Lombardy or beautiful Tudor elegance at Henley Park Hotel. Enjoy one of the most beautiful outdoor pools in the city at the Washington Plaza Hotel, designed by renowned architect Morris Lapidus. Our State Plaza Hotel sits on a tree lined street in beautiful Foggy Bottom, an all-suite hotel perfect for business and leisure travel. Our portfolio of Washington, DC hotels showcases the beautiful architecture, culture and genuine hospitality of our nation's capital. Experience the grandeur and timeless elegance of our historic boutique hotel in Washington, DC. A beautifully restored Tudor-style building, The Henley Park Hotel offers boutique accommodations enriched by antique furnishings, plush bedding, and elegant décor. Linger over afternoon tea in the Wilkes Room and then visit our Tavern Restaurant for dinner and enjoy drinks in our Blue Bar lounge. This exceptional Washington, DC hotel boasts convenient business options and 24-hour room service. Experience the storied legacy of one hotel that combines four buildings that spans 4 centuries. We are proud to be the only hotel in Washington DC listed on the National Register of Historic Places. One block from the Washington DC Convention Center, federal and local government buildings, and downtown attractions and sights, the Morrison-Clark Inn is a magnificent link to the District's glorious past. We offer a distinctive alternative to standard hotels in downtown DC. Select from a wide range of beautifully restored rooms blending historic elegance with modern comfort, we invite you to experience the excitement of the city from our landmark setting. Situated in the heart of DC's Business District, Hotel Lombardy offers a classic European-style experience for discerning business and vacation travelers. A blend of historic charm and contemporary urban sophistication, our downtown boutique hotel offers elegant accommodations and exceptional hospitality just steps away from Washington, DC attractions, government buildings, and corporate destinations. Exquisite architectural details and gracious hospitality make Hotel Lombardy a stand-out. Situated on historic Pennsylvania Avenue, this Washington, DC hotel is one of the city's premier properties with impeccable service. Settled on a tree-lined street in the Foggy Bottom neighborhood, State Plaza Hotel offers a refined urban retreat in the financial district in the shadow of the national memorials. Enjoy beautiful art deco decor and residence-inspired suites that feel like luxury city apartments. The ideal hotel for business travelers and leisure guest., State Plaza offers sophisticated meeting space for groups up to 100. Just two blocks from the National Mall, our hotel in Foggy Bottom is within walking distance to the K Street business corridor, government buildings and international business headquarters. We are a few blocks of iconic attractions, including the Lincoln Memorial, White House and the Kennedy Center. After a day of business meetings, or site seeing enjoy American bistro cuisine at our Garden Café. Join us for Happy Hour or enjoy dining on the outdoor patio. Discover the Washington Plaza, a luxury hotel in the heart of downtown DC. Designed in 1962, this freshly renovated Washington, DC hotel offers an engaging balance of cosmopolitan ambiance and unpretentious hospitality. Step outside to explore 14th street, one of DC's most vibrant neighborhoods, or the National Mall. Enjoy innovative American cuisine at Ten Thomas restaurant and drinks in The International. Host an event in 12,000 sq. feet of high-tech meeting space with complimentary Wi-Fi. 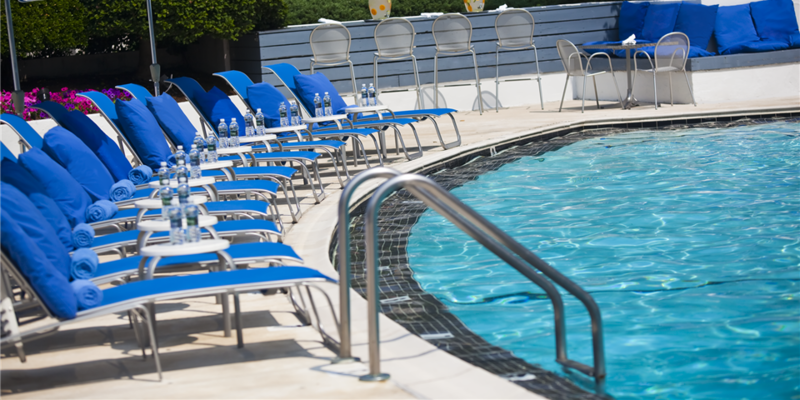 Experience the beautifully landscaped pool and poolside bar at this bright, modern Washington, DC hotel.